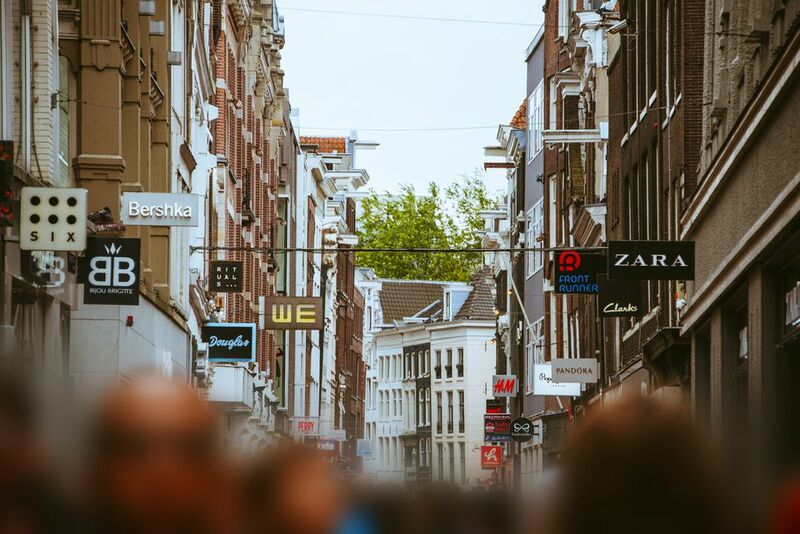 Unlike in the United States, retailers in Amsterdam and the Netherlands don't put on huge sales throughout the year or even at the end of each season. Here, and in many other European countries, locals and in-the-know visitors understand that January and July are the major clearance months when stores offer the biggest discounts. Although Amsterdam no longer has to hold sales only during fixed times of the year, these two months are still when you will find the lowest prices on seasonal items. So if you're in Amsterdam braving the chilly days of January or the high-season crowds of July, you'll be rewarded with the chance to rack up in Amsterdam's best shopping areas. Don't miss out! Note that in Amsterdam, you'll pay a sales tax of 6 to 19 percent; if you're from a non-EU nation, save your receipts to apply to get that back, or look for shops that offer tax-free shopping for non-EU residents. Shops that display tax-free shopping signs in their window may even be able to refund the tax onto your credit card at the point of purchase if you show your passport. Every year during January and July you'll find store windows emblazoned with sale posters reading UITVERKOOP, OPRUIMING (both mean "clearance sale"), SOLDEN, or simply SALE. Even stores on some of the more posh shopping streets, such as Haarlemmerstraat, Utrechtsestraat, the Nine Streets (Negen Straatjes), and Cornelis Schuytstraat—whose prices during the rest of the year may keep some shoppers at bay—participate in the biannual sale. But even the more economical stores—like price-conscious Dutch department store HEMA, whose one-euro breakfast is a year-round deal—slash their prices these times of the year. And it's not only fashion retailers that participate—shoppers can find sales in all variety of stores. Although January and July are the set months for the clearance, stores can decide which weeks to hold the big sale, and even extend sale prices into December or June. So shoppers can spend the whole month hitting sales store to store. When shopping during these clearance sales, you can expect to rub elbows with hundreds of other bargain-hunters for deals and steals at up to 70 percent off regular prices. Savings start at 10 percent off and increase to more than half off the original price tag. Usually, only a small part of the store is designated to the sale items. Not visiting Amsterdam in January or July? No worries—you can still benefit from some smart shopping. Although previously Dutch stores were only allowed to have sales at certain times of year (this is still the case in Belgium), those laws have loosened up, and more sales have started to pop up all year round—it has become less unusual to see end-of-season sales, especially at fashion retailers and at chain stores that have locations worldwide. One of the most famous sales in the country, the three-day sale at De Bijenkorf, is actually held every September, as it has been since 1984; just visit De Bijenkorf's scenic location on Dam Square to experience the national phenomenon. Amsterdam now also has mid-season sales—one for the spring, in March and April, and one for fall during the months of September and October. Still, January and July remain the two months of the year with the most sales by far.